We see the world through the lens of the wicked. It seems only the most deviant, heinous, and violent happenings on earth catch our eye and is whispered on our lips. A lot of people feel that becoming #concious means seeing the ugly side and raging against it, unknowing that they themselves have become the ugly side. Yes, change is needed. The brutality against Blacks, the abduction of children, the war on melanin is happening, but only inside of us. Picket signs won't stop it, prayers will be muted, even a bullet aimed at the right #pinkterrorist won't win the #revolution...until we change ourselves. RAISE YOUR #VIBRATION CHANGE YOUR LIFE . 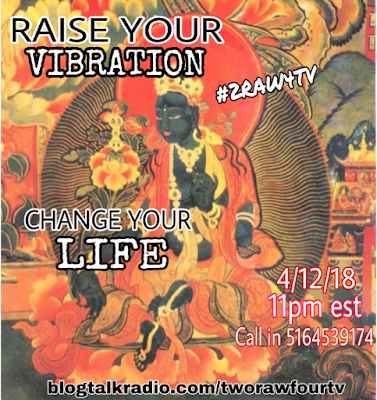 Next #2RAW4TV we will show how raising our own frequency, illuminating our own light, and burning our own fire can change our conditions with a panel of people actually doing it, NOW. Become wealthy, become healthy, become wise, become invincible right now. It all begins within. If Black people don't raise their vibration soon it will be too late! This Thursday set your alarms and tune in to the most transformative broadcast this year... raise your vibes or die!